A must have picture for a golfer - this cute little bird is quick and easy to work. 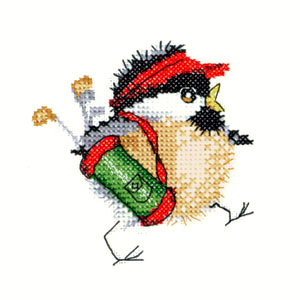 This kit is from the series Chickadees by Heritage Crafts from the watercolour paintings of Valerie Pfeiffer. The large scale black and white charts are printed 10 stitches to 1 inch on an A4 booklet with one page showing the whole and partial cross stitch and the opposite page showing the added backstitch and long stitch detail superimposed on the chart. The pattern is worked in 13 shades of stranded cottons over 46 by 46 stitches. charts, a needle and instructions.